Trade is of paramount importance to Singapore, as a globally-oriented and open economy. The importance of trade to the country is reflected in the fact that the value of Singapore’s external trade has consistently been three times that of its gross domestic product (GDP). 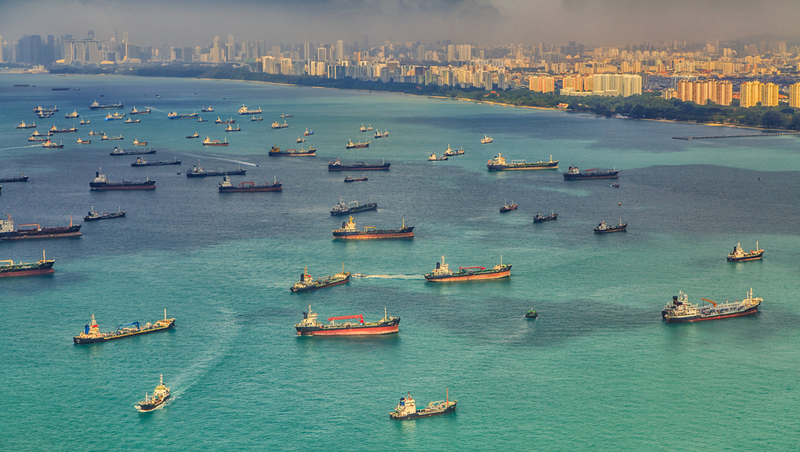 In 2014, Singapore’s ports handled 33.55 million Twenty-foot Equivalent Units (TEUs) of containers. The expansion of trade volumes in an increasingly globalized world has brought about increased prosperity, but also increased risks. Errant traders, organized crime groups, and terrorists have become more sophisticated in exploiting supply chain vulnerabilities to move goods illegally across borders. Increasing public expectations add a new dimension to the already daunting challenges faced by Singapore Customs. Improved levels of education, greater exposure, and more familiarity with international trade and regulatory practices mean that traders increasingly expect a high level of transparency, predictability, and effectiveness from government agencies. The public also expects government agencies to protect society from the effects of harmful and illegal goods. The emergence of new industries and business models also increases the need for regulatory authorities to introduce new schemes and customized service offerings to meet their needs. Singapore Customs consciously seeks to keep up with the rapid pace of the changes, and to pre-empt the needs of traders by engaging them actively, in order to add value to their operations, and ensure that legitimate trade thrives. Singapore’s early experience in developing its National Single Window (NSW), known as TradeNet, provided it with the insight that coordinated border management (CBM) is fundamental to developing and sustaining a SW environment. Both the NSW and the CBM mind-set are complementary elements of Singapore’s ‘whole-of-government’ (WOG) approach to providing efficient services to the trading community. Using TradeNet, the trading community is able to submit permit applications electronically for processing, via a single point of entry to government agencies. All national competent authorities involved in regulating trade flows, including the Agri-food and Veterinary Authority of Singapore (AVA) for food and plants, the Health Sciences Authority (HSA) for medicines, and the Infocomm Development Authority of Singapore (IDA) for telecommunication equipment, are part of TradeNet. Once TradeNet receives the declaration submitted by the trader or their appointed agent, it will automatically route the declaration to the relevant competent authorities for processing. The major realignments needed to support Singapore’s NSW implementation were achieved through extensive discussions and consensus building with government agencies, companies, organizations and industry associations. This focus on achieving a ‘win-win’ outcome enabled all parties involved to overcome the initial difficulties, as they saw the potential savings and benefits from reducing the burden associated with handling trade documentation. The journey to achieve a WOG approach for trade regulatory issues did not start overnight. The business process re-engineering undertaken as part of Singapore’s NSW environment in 1989 provided a strong foundation for the then Customs and Excise Department, and partner government agencies involved in trade regulatory issues. This foundation was followed by further consolidation, continual improvements, and increased coordination over the years. One of the most noteworthy developments in recent times took place in 2003, when the government recognized the need for greater synergy, and for a reorganization of the trade and border authorities in Singapore. This resulted in the formation of the Immigration & Checkpoints Authority of Singapore (ICA) as the single command for checkpoints and border control functions, while Singapore Customs was established as the single contact point for all Customs, revenue, and trade matters. Whereas the former Customs and Excise Department was mainly focused on revenue matters, the new Singapore Customs is vested with responsibility for both revenue and trade facilitation matters. 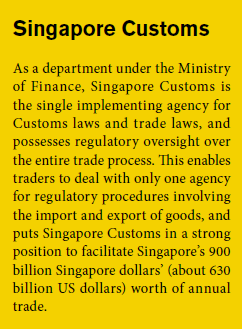 This working arrangement allows the ICA and Singapore Customs to share the responsibility of securing Singapore’s borders, and yet be effective in facilitating legitimate trade. Data is essential in the modern border regulatory environment. Effective risk management is heavily dependent on the availability of data, as well as the ability to integrate the available data so as to inform selectivity and tactical decision-making. Through TradeNet, all agencies with border regulatory functions are able to process their respective regulatory requirements through an integrated interface. In this way, agencies are able to focus on their respective control areas, while the system provides the functionalities to route declarations to the relevant agencies, and provide approval responses to trade. However, the challenges of the modern trading environment require a higher level of sophistication. Agencies must not only focus on their respective control areas, but also recognize cross-cutting risks, and ensure coordination between different government stakeholders. The security and integrity of the trading system is not merely the job of one agency, but affects the entire country as a whole. With this in mind, Singapore Customs works closely with the ICA, using a risk-based approach, in order to identify shipments posing security risks, and take steps to mitigate such risks through actions on the ground. The two agencies cooperate on joint risk profiling and targeting efforts, rendering operational assistance to each other when suspicious shipments are detected. They share their targeting results, and any decision to inspect a shipment is known to both agencies. Customs and the ICA even consult each other on decisions to inspect or interdict shipments when necessary. An example of this coordination was demonstrated in January 2014, when Singapore Customs and ICA officers jointly supervised the scanning of a 40-foot container which had been targeted by both services, and had consequently been sent to be scanned. The scanning results revealed inconsistencies in the radiographic image. 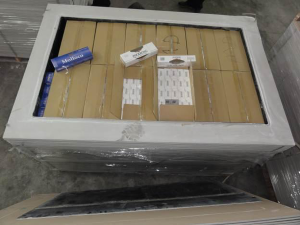 As a result, a controlled delivery was carried out by Singapore Customs, leading to the successful dismantling of a cigarette smuggling ring – 14,999 cartons of duty-unpaid cigarettes were seized, and four suspects were arrested and successfully prosecuted. Such cooperation efforts to secure Singapore’s borders are not limited to Singapore Customs and the ICA alone. Singapore Customs and the ICA also collaborate with other competent authorities to ensure that illicit goods under their respective jurisdictions are not unlawfully imported into Singapore. 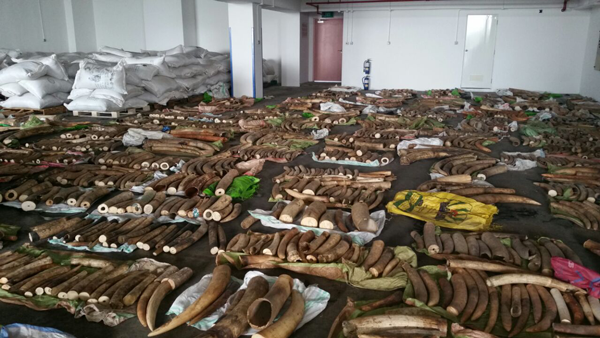 In May 2015, Singapore Customs and the ICA worked with the AVA – the competent authority for species protected under the Convention on International Trade in Endangered Species of Wild Fauna and Flora (CITES) – to identify and subsequently seize a shipment of about 3.7 tonnes of ivory tusks, rhinoceros horns, and teeth believed to be from endangered feline species. The shipment had been declared as tea leaves, and had been concealed among bags of tea dust. The haul was estimated at 8 million Singapore dollars (about 5.6 million US dollars), and was preceded by another significant seizure in 2014. These seizures were the result of sustained collaboration between Singapore Customs and the AVA to curb the trafficking of illegal wildlife products through joint targeting efforts. Over the years, this collaboration has led to a number of successful seizures involving goods protected under the CITES. CBM is a necessity for Singapore, given its need to be a secure and business-friendly global trade hub. This national imperative is recognized by all border regulatory agencies as a shared responsibility. While organizational boundaries may exist, maximum efforts are exerted to seek out positive synergies to improve border processes, and assure the integrity of the trading system. Singapore’s small physical size and manpower constraints also mean that no single agency is able to discharge all of its regulatory responsibilities in a self-contained way. Agencies, by virtue of their specializations, will best know the risks that affect the commodities under their control. Even though Singapore Customs and the ICA may have broad powers under the law to act on behalf of partner government agencies, both Customs and the ICA recognize that such authority needs to be exercised in collaboration with those partner agencies so that their specific knowledge of their domain can be brought to bear, for maximum success rates in detection and enforcement. In this way, relatively larger agencies, such as Singapore Customs and the ICA, which have stronger enforcement competencies and experience of cross-border regulatory offences, are able to provide support to other agencies for undertaking seizures and carrying out enforcement on suspicious shipments detected. Consequently, all agencies work together to achieve the synergies necessary to meet their respective regulatory mandates, and contribute to the prosperity and security of the country.